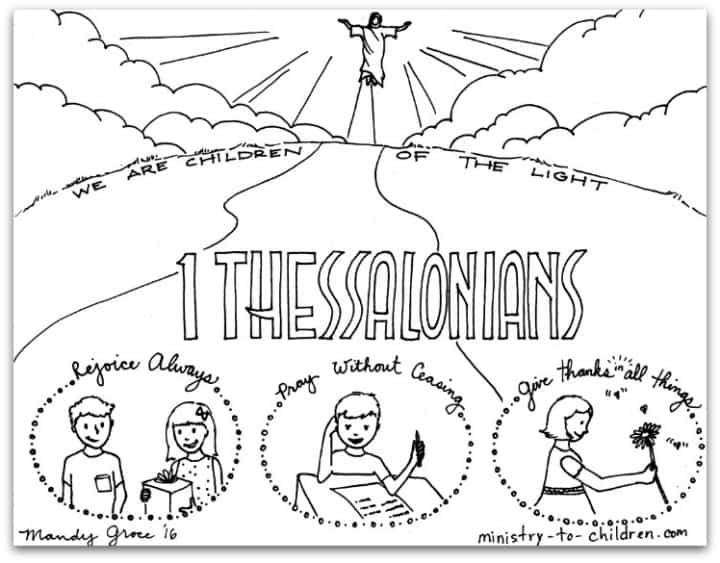 This free coloring page is based on the Book of 1 Thessalonians. It’s one part of our series of illustrations for each individual book of the Bible. You can search our website for other lessons and activities from the book of 1 Thessalonians. Click here to download the print friendly PDF version. We’ve also uploaded the image in JPEG format. It shows an outline of the resurrected Jesus ascending into heaven. Below are three scenes of children. One is giving a gift, the other is writing in a prayer journal, the third is enjoying a flower. We are children of the light …. Rejoice always, pray without ceasing, give thanks in all things.